Stock # 64155, 6.0L Vortec 1000 V8 SFI Engine, Automatic, 97464 mi. 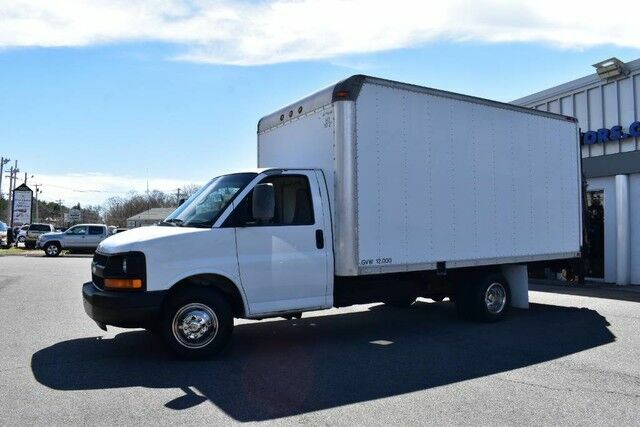 2007 Chevrolet Express G3500 16 ft Box Truck with Power Lift only has 97,000 miles. It is in great shape for the year and miles, drives very solid and frame is in good shape, lift works good, please look at all the pictures to see how nice this vehicle is. This 2007 Chevrolet Express Commercial Cutaway comes with a CARFAX Buyback Guarantee, which means you can buy with certainty. It's not often you find just the vehicle you are looking for AND with low mileage. This is your chance to take home a gently used and barely driven Chevrolet Express Commercial Cutaway. Driven by many, but adored by more, the Chevrolet Express Commercial Cutaway C7N is a perfect addition to any home. The Chevrolet Express Commercial Cutaway C7N will provide you with everything you have always wanted in a car -- Quality, Reliability, and Character. GVWR 12300 lbs. (5579 kg) (Includes (R05) dual rear 6 - 16" x 6.5" (40.6 cm x 16.5 cm) wheels on the *G33503 model. Not available with (R04) single rear 4 - 16" x 6.5" (40.6 cm x 16.5 cm) wheels. Reference the Engine/Axle page for availability.